This is so very Japanese. 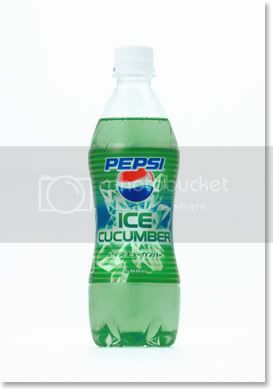 Pepsi Ice: Cucumber. When will the demands of tens and tens of Americans be answered with Pepsi Ice: Barley, Hops & Yeast? I was at a Mets game c.2002 and Pepsi had a promotion where every fan got a free bottle of Pepsi Blue when leaving the game. The result was a parking lot littered with about 35,000 bottles of PB, each w/ one sip missing. And some blue vomit. This stuff looks MUCH better though. ‘Cause they had s-o-o-o-o much success with Crystal Pepsi. Keep trying, you numbnuts. Japanese superheroes wear no pants. And play the guitar. With poo.